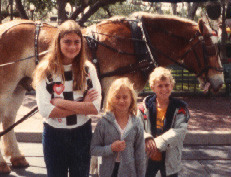 On left above: Shannon, Adam, and Jenny at Disneyland (photo by Susan) in 1983. 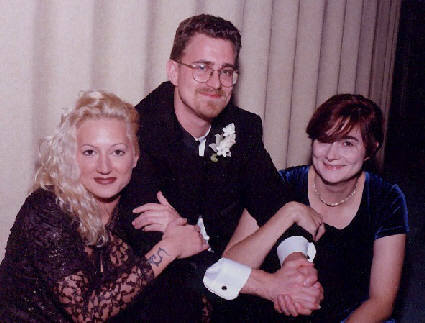 On right above: same motley crew at Adam and Becky's wedding. This photo was also taken by Susan. 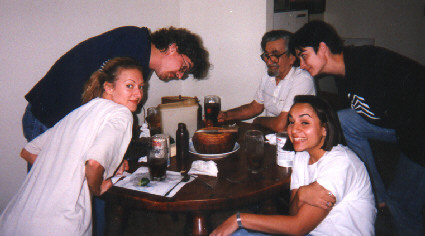 It was taken in 1998, at one of Adam's 25th Birthday Parties. This happy event, I am proud to add, was held at my sixth floor apartment in the Houston Heights Tower. You will notice that the three siblings are joined by Adam's soul-mate, Becky, and first person singular. Anyone in the photo can tell you what my logical reasoning was when I selected this particular background music.